A grand bottle of pink Champagne, round and luscious. The flavors come on like a cherry cordial, with exceptional Pinot Noir character and finesse. It is a seductive, elegant and textured wine that shows a level of detail and length that only the finest examples achieve. Subtle but very rewarding. A champagne that blends freshness and intensity. 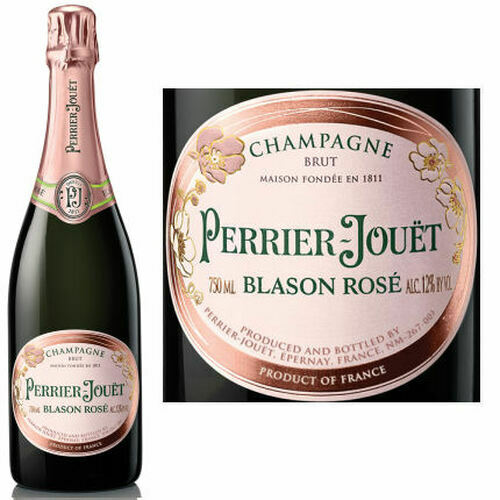 An exquisite delicacy in the floral, stylish and diamond-cut style of the House of Perrier-Jouet. The Blason Rose is graced with a luminous rose color, shot through with glints of pale orange. Its fine, lively and persistent sparkle lends it an intense freshness. Pomegranates, pears, apricots, blood oranges, the fragrances of mature red fruits. . . a juicy and generous blend that gives way to notes of biscuit, butter and pastries. The delicate character of white flowers remains throughout. 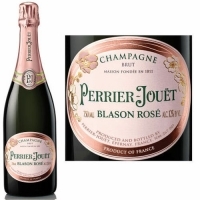 The Blason Rose is an intense and balanced champagne. Blackcurrant buds, pear, apricots and cherry plum emerge first, only to give way to the fragrances of blackcurrant and blood oranges, followed by notes of creme de cassis, raspberry, honeysuckle and roses, culminating in lime, blackberries and Morello cherries. With its sharp and strong sensation, the Blason Rose is a supple and complex wine. Rich and long in the mouth.